1:30 in the morning, knock at the door. I barely stir. I know Danita has been in and out or the room communicating with the luggage handler. By the tone of her voice, the suitcase has finally arrived…and with a “RUSH” tag no less. Last night, we scheduled our breakfast to be delivered at 9:00…and right on time, we are served on the terrazzo. There really are no words that can add to the photos. Breakfast was quite an experience! Luckily with the arrival of the suitcase, Danita will not be wearing sequins and bangles to the beach. We grab our sunscreen, kindles and hats and head out. In case you didn’t like that song or you just want to hear a bit more…follow me. SInce we are both going down, we meet ancora. As you can tell by the video, we did a quick scoot to get in front of the band. Although they were stopping for a break, you never know when they could get the urge again and we’ve got a beach with our names on it. Danita recently planted a Bougainvillea at home, she wonders if it could ever look like this. When we arrive yesterday, this lovely, vine topped path was wall to wall people. We stroll down, down, down. We’ve got our bearings now. 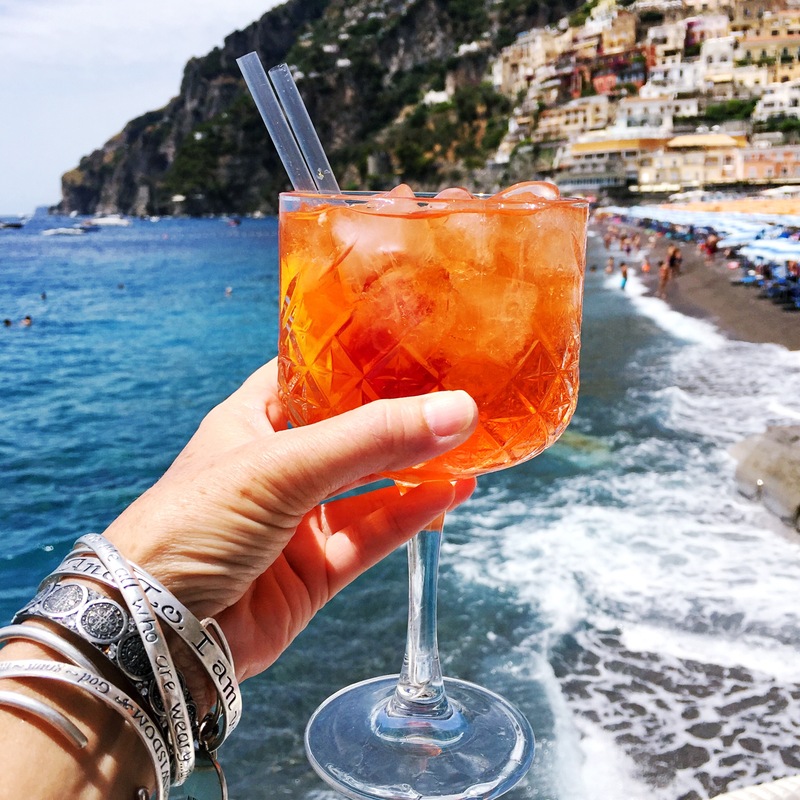 When we first arrived I thought I would never know where I had been or be able to figure out how to get back to the room…I have a totally different take on Positano now. As I have always advised,one day at a spot is never enough to judge it accurately…I say three is the minimum. Normally I would have been a bit nervous (Danita points out that I am “nervous” a lot…I need of think of a better word; anxious, expectant, apprehensive…I’ll work on that… oath the word and the emotion) regarding whether we would be in time to get a great spot at la spiaggia…but since we reserved our spots yesterday, all is good. Benvenuto a la Scogliera…Antonio will show us to our spot. Non male huh!? Again, the little reserved sign with “Page” on it…too heavy for the suitcase. When Antonio started pouring the water, hand behind the back and all…it cracked me up. 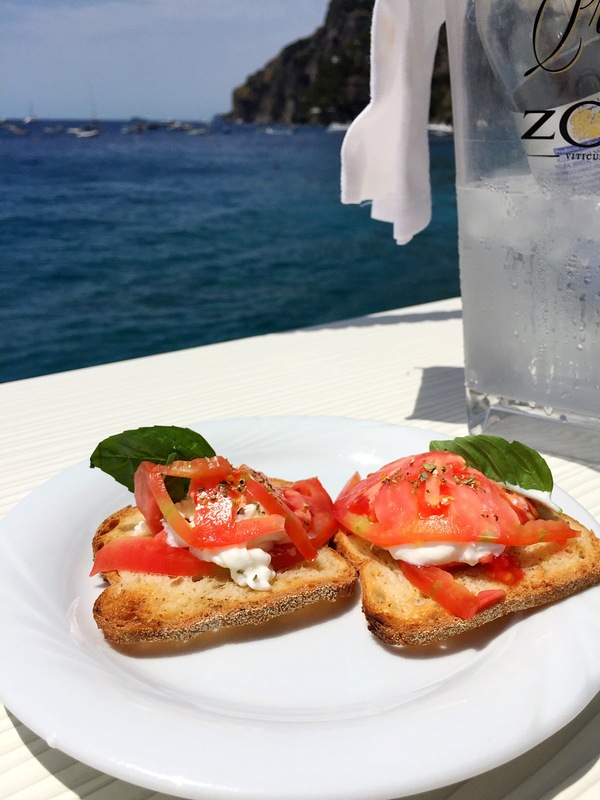 But, when at la Scogliera, we decide to enjoy all they have to offer. 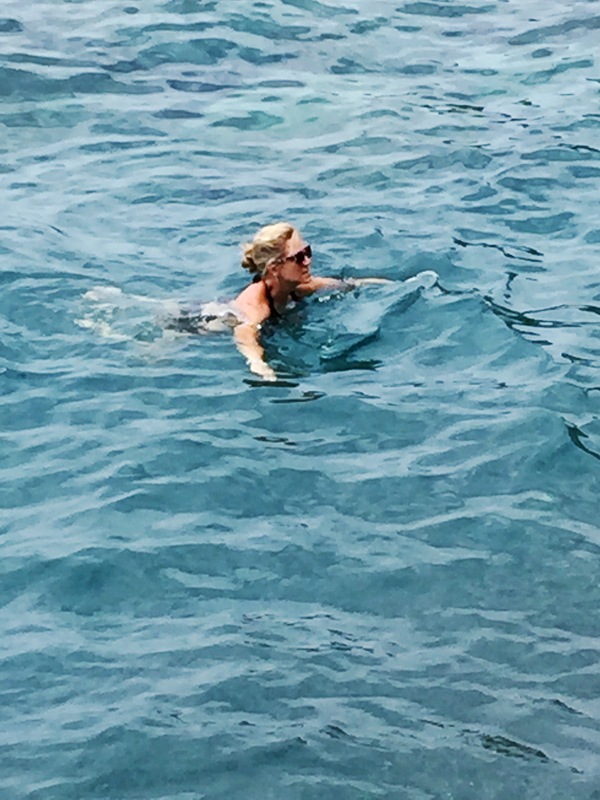 Danita was very excited about her first dip in the Mediterranean. 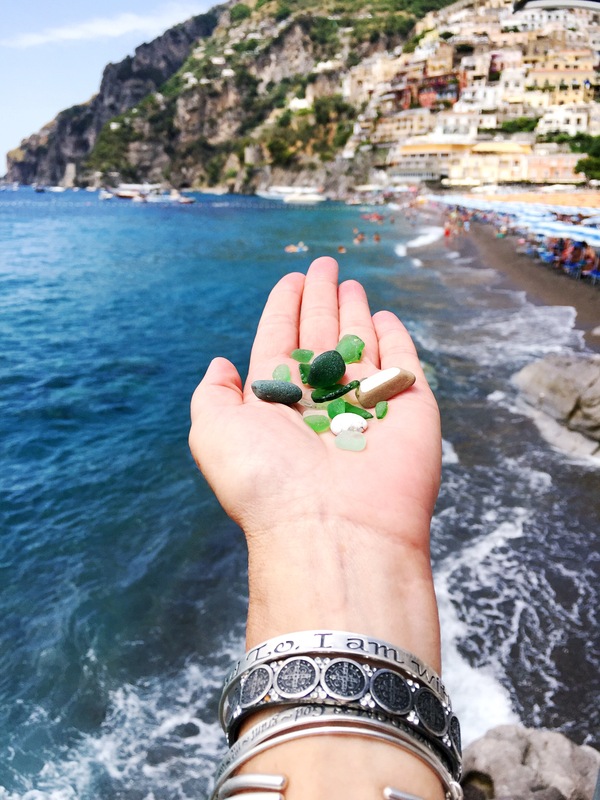 We both found handfuls of beautifully hued Sea Glass. Later in the day, the cocktails did not disappoint. The snack Antonio brought for aperitivo was the best “Beach Bite” I’ve ever had. I got a Spritz Shot that rivals all others. 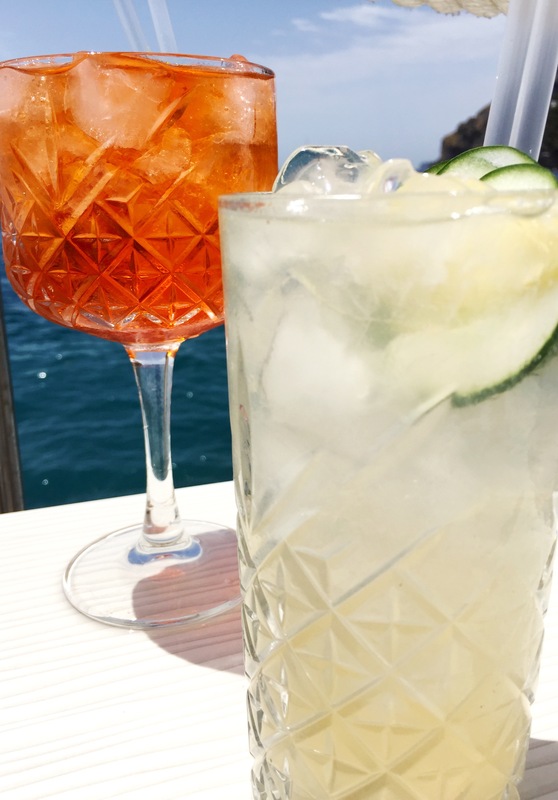 If you have plans to visit Positano, Insuggest starting a la Scogliera fund now. It is worth the extra euro, at least for one day. Just make it a day where you have nothing else planned. As most good things, all too soon, it was time to go. We had our spot until the evening, but as Danita’s plans have changed, she needed to get back to Villa Yiara to pack. Her car was to pick her up at 19:00 to whisk her to Roma, catching an early morning flight tomorrow. One last dinner together. Another great rec of Imara’s. Like these due bicchiere di vino, Danita and I have different qualities and notes to us, but are perfect table companions. 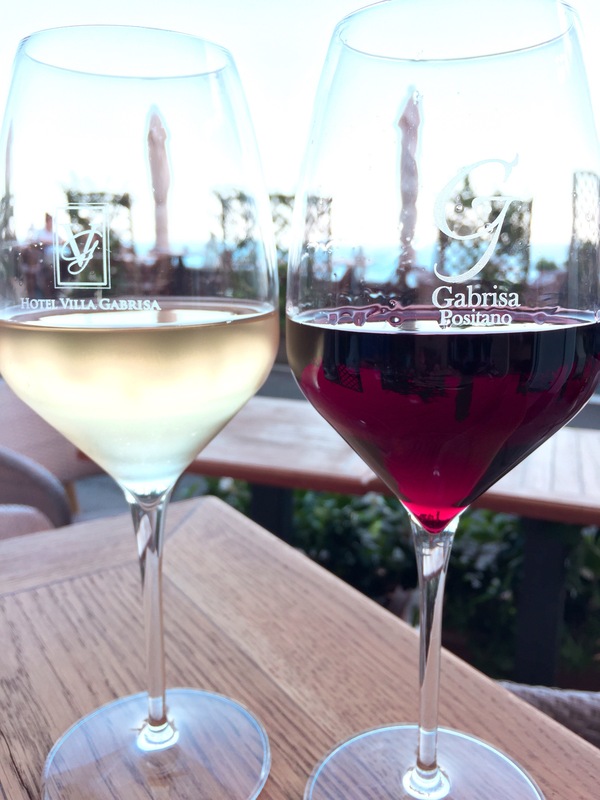 Our last meal in Italia introduced us to two new specialties. 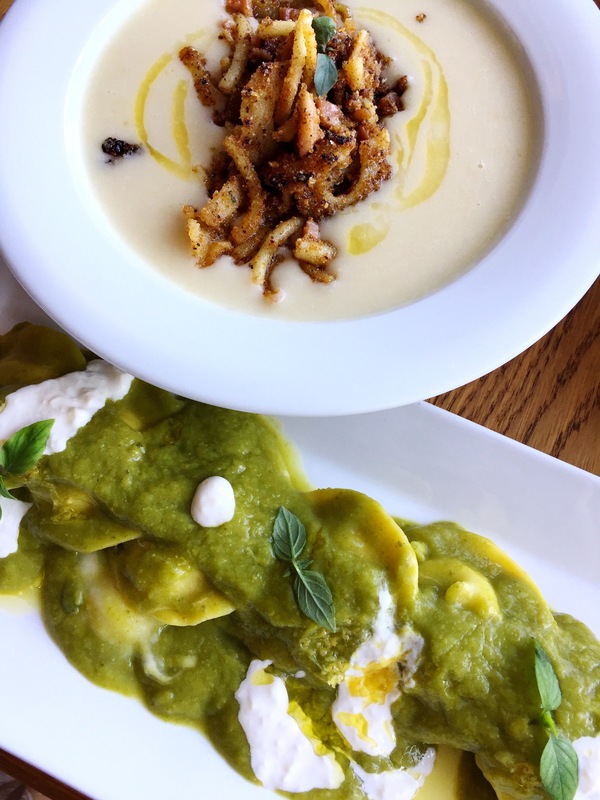 The zuppa, pasta e fagioli con guanciale will fatto nelle nostre case. As we said our Arrivederci, and Danita drove away, Il mio cuore era triste, but the memories we will share per sempre. 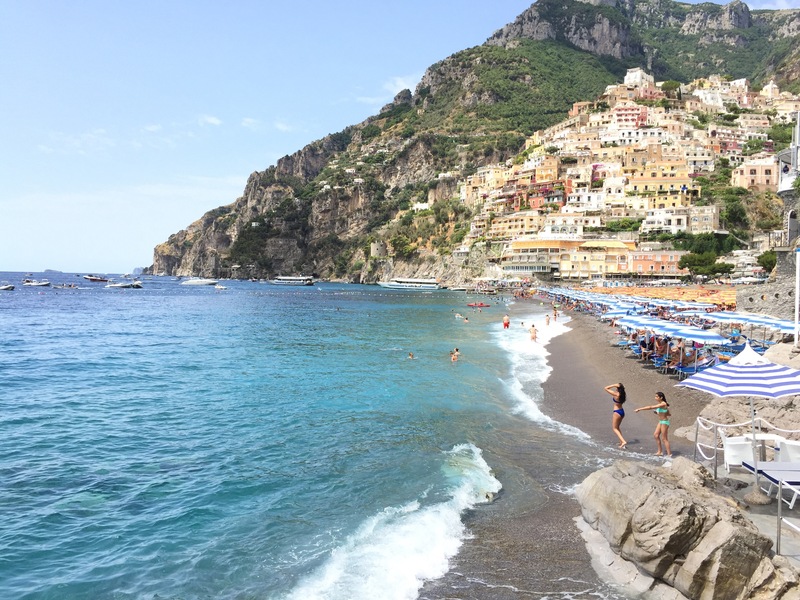 This entry was posted in Uncategorized and tagged Italy, La Scogliera beach resort, Positano, Villa Yiarra Positano by paigetc. Bookmark the permalink. At first glimpse of you at breakfast, I saw Rita. How lovely. What a wonderful trip.